Emsisoft Anti-Malware takes care of the dirty work!. Why Do AJR Recommend Emsisoft? We are very pleased to inform our customers that we are an official Emsisoft reseller partner and have been over the last several years and have not looked back! It’s our number 1 and only choice for anti-malware protection and detection… and we have no doubt at all about our decision to recommend and provide it to our customers. We know it’s the right one for us and you and your business as we only recommend the products we use ourselves. Having used Emsisoft over several years and following their progress and awards for their results over the years we decided we wanted to partner with them so we can provide our customers with the best possible Anti-Malware Solution. Emsisoft Anti-Malware is a proactive weapon designed to prevent infection from all the latest Internet threats, protecting your system from the worst case scenario by not even allowing it to occur. When you purchase Emsisoft Anti-Malware, you purchase 3 layers of malware prevention. Preventing connection to known dangerous and fraudulent websites. If you unintentionally try to access a website that spreads trojans, spyware, or any other type of malicious program, Emsisoft Anti-Malware will prevent you from connecting. Our software does this by utilizing a built-in list of known dangerous and fraudulent websites, which is automatically updated every hour. Scanning for malware, in real-time. This crucial layer of protection checks all files that are downloaded or run against more than 10 million signatures of known malicious software. The Emsisoft Anti-Malware File Guard is intelligent by design and self-optimizes continuously, allowing for real-time protection that scans dozens of files every single second. Most importantly, File Guard operates in the background of your computer, meaning you don’t feel the impact of its power. The ultimate defense To catch zero-day threats that aren't yet included in the signature database, Emsisoft Anti-Malware continually monitors the behavior of all active programs and raises an alert as soon as something suspicious occurs. Combined with the live cloud-verification of the Emsisoft Anti-Malware Network it is our ultimate weapon against specialized and sophisticated malware attacks that others can't protect you from. Antivirus & Anti-Malware, all-in-one Solution. Cleaning up after malware infections is hard work. That’s why you need an anti-malware solution that’s very powerful, but not at the cost of efficiency. Emsisoft Anti-Malware is fueled by a dual engine malware scanner for twice the malware cleaning power, with no extra resource requirements. 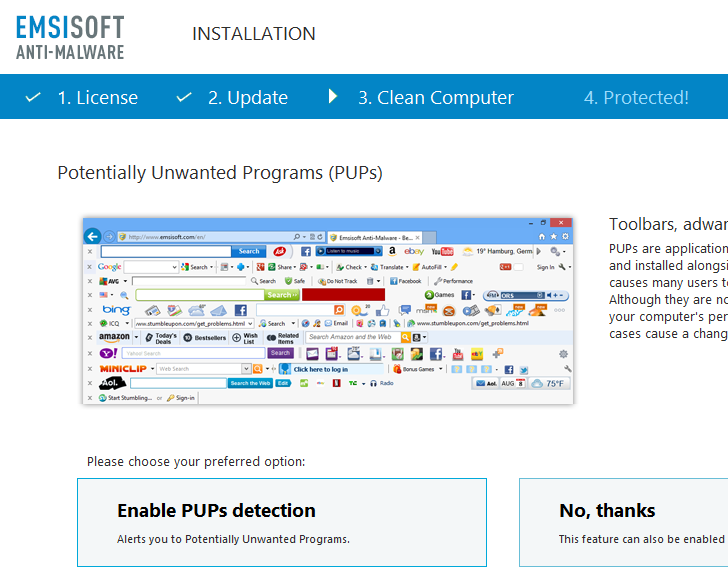 On top of that, Emsisoft Anti-Malware can even remove potentially unwanted programs (PUPs) that overload your computer with resource wasting bloat. Emsisoft Anti-Malware is designed to use as little computing resources as possible. That’s because your computer is a lot like a human, and it can only perform so many tasks at once, and if it gets overloaded it will crash!. 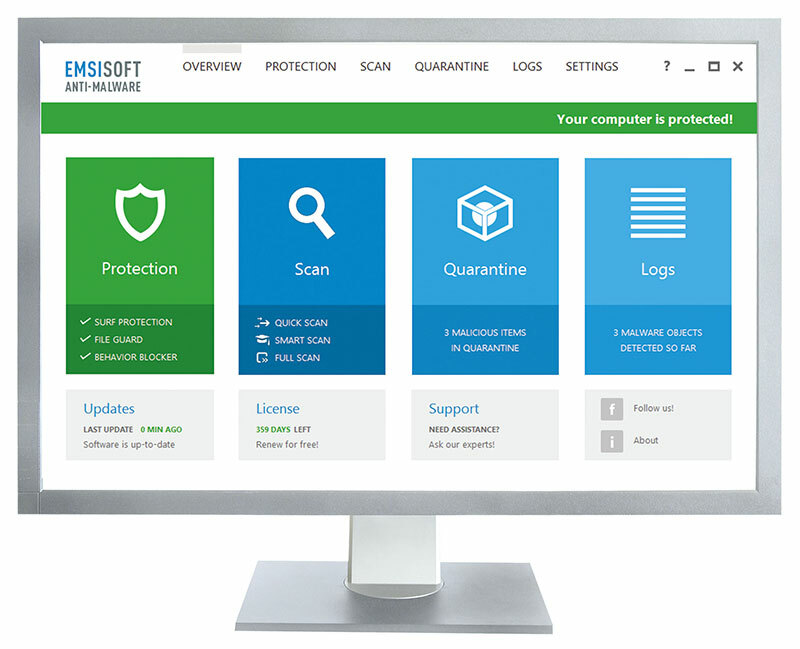 With Emsisoft Anti-Malware, they have combined two of the best virus and malware scanning technologies in the security industry at the lowest level possible to ensure optimum detection rates and at the maximum speed. The result is a user-friendly anti-malware that completely protects your computer system and digital life, leaving the computer’s power exactly where it belongs: with you. Get The Best Anti-Malware Protection On The Planet Today!